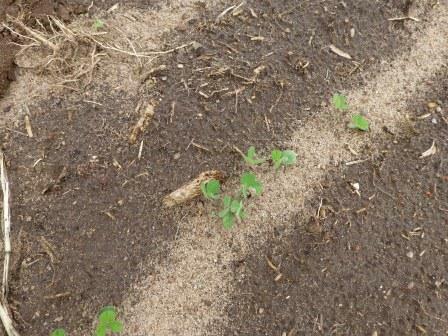 Can you still gain value in a cover crop when it is planted after wheat in a dry year? 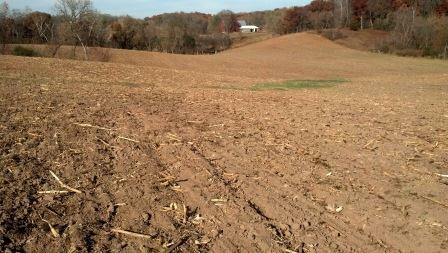 During the week of October 15, 2012 I traveled a wide swath of Wisconsin looking at cover crops. In the eastern half of the state the cover crops looked very good. In the western half the cover crops looked desperately poor. The difference? Moisture. While on farms near Osceola, WI (right along the St. Croix River – the river that forms the border between Wisconsin and Minnesota in that part of the state), I observed a sad sight. 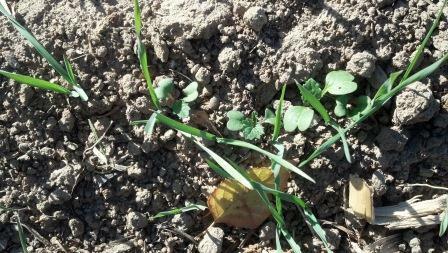 Cover crops that had been in the ground for 6 weeks were either not germinated or had little growth. While the early part of the growing season had more than adequate rainfall and corn yields were near 200 bu/acre, the last 7-8 weeks has seen less than 1/2″ and the cover crops look…well, they look horrible. Near Hancock, in the Central Sands Region of Wisconsin, there is a mixed bag of results. Again, it was dry for several weeks before and after the cover crops were planted after the wheat crop had been harvested. A few days before my cover crop field day there was a 4 inch rain. The farmer and dealer present said that the plot “changed overnight” as it had grown so much since there was some moisture. The beautiful thing about the cover crops in the central sands is that they established and actually looked amazingly good compared to what I envisioned they would. The winter cereal rye was tillered nicely and the oats were 5-6 inches tall. The radishes, oats,and rye all drilled through the compaction zone that we found at 3-4 inches deep. What was not apparently impressive was the crimson clover or Austrian winter peas – at least not for coverage or height. The crimson clover was only about 1 inch tall and the peas were 3-4 inches tall. However, what was surprising was how many nodules were on the clover and peas and that the roots were 4-5″ deep and through the compaction zone as well! The crimson clover was not at all impressive even though the seed was planted 7 weeks previous to this photo being taken. However, with virtually no rainfall it is amazing there was any clover established at all in the Central Sands Region of WI. Seven or eight weeks of dry weather did not help cover crops in this field near Osceola, WI emerge very quickly in 2012. Will there be any value to this cover crop? Sadly, no. Note how small the radishes and turnips are. These cannot be declared valuable to this farmer. Thankfully the winter Rye should survive the winter. With less than 1/2″ of rain since planting into dry soil, this cover crop field in western Wisconsin near Osceola never had a chance to achieve the goals the farmer had for it improving the soil. This is the test plot in the Central Sands Region. 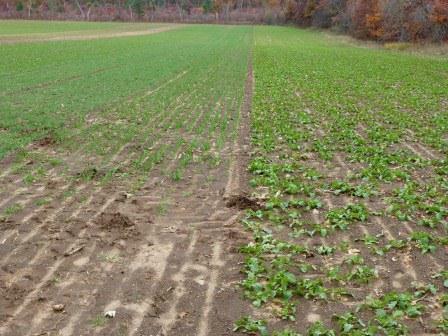 From Right to left; Radishes, Oats, Winter Rye, and various mixes. Are these cover crops valuable? I believe so because they are through the compaction zone and the rye and many of the mixes will have components that survive the winter. 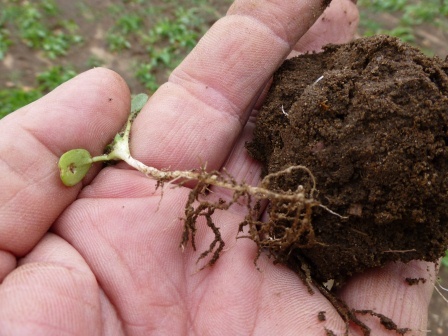 If you enlarge this photo you will be amazed how many nodules are on this tiny crimson clover plant. The roots were over 5″ deep which was through the compaction zone at the Hancock, WI plot. 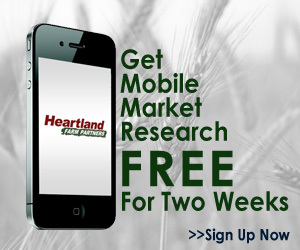 ← Cover Crops and Bears?